There’s no doubt that being able to drive makes getting around easier and faster, whether it’s getting to work every day or going to the grocery store. 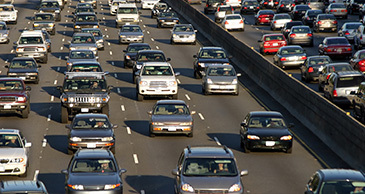 The problem comes in when you don’t know how to drive, or don’t feel comfortable enough behind the wheel to get around. The team at Pacific Driver Education, including DMV and ODOT-certified Traffic Safety Educators Lois and Steve Lents, want to help adults of all ages learn how to drive, improve their confidence behind the wheel, and increase their quality of life. Our complete adult driver’s education includes all of the necessary information you would expect from a driver’s ed program, the basics of driving a car, defensive driving, rules of the road, and more. When you’re preparing to take a driving test, lessons from certified instructors will ensure that everything is covered. We have been teaching new drivers for a decade and have the experience, knowledge, and skill to teach you exactly what you need to know to be a safe, licensed driver in the state of Oregon. We also know what Oregon driving tests involve, so we know just what to teach you. And you can count on these skills every time you get into your vehicle. A crucial part of our program is understanding the rules of the road, including knowing all of the signs, what to do at a four-way stop and other “right of way” rules, passing rules, pedestrian and bicyclists rules, and more. When you have a complete understanding of the rules and laws, you will be able to confidently navigate through all sorts of situations. We will cover driving in various weather conditions and depending on when you take your adult driving lessons, you will get on the road experience. We’ll go over parking skills and give you time to practice. You’ll have plenty of opportunity to practice merging. We’ll also go over concepts like defensive driving, which includes what to do when you come across an aggressive driver, being aware of your surroundings, and more. We can administer your driving test, as well as prepare you for the test. We understand that this may be one of the more intimidating parts of learning how to drive, but with our guidance and advice, you will feel confident to take on any exam and driving test. Pacific Driver Education wants to make it as convenient as possible for adults to learn how to drive. When you sign up for a driving lesson, we will do our best to work around your schedule so that there is as little disruption to your life as possible. All students must have a valid Oregon drivers permit, license, or other license granting driving privileges in Oregon. Please note that your lessons will begin and end at your home in the greater Portland Metro area in one of our vehicles. There is NO TRIP FEE for this service. We offer lessons six days a week: Monday through Saturday between 9am and 5pm. Your lessons may begin at your home, school, or place of business with exception to locations in the downtown Portland area. Due to high demand, private lessons are scheduled in order of paid registrations. Once you have registered for lessons, you will receive an email inviting you to submit your general availability. It takes two to three business days for our scheduler to create a lesson schedule that meets your calendaring needs. Our scheduler will then email you a tentative schedule, asking you to confirm your drives. Once we establish your lesson schedule, we will provide you with your instructor’s name, cell phone, and email address. Please keep in mind that lessons on Saturday's are booked out for 60 days. We have several different lesson packages from which to choose. A single drive lesson, a package of four drive lessons and courses for adults that includes classroom and behind the wheel drive lessons. 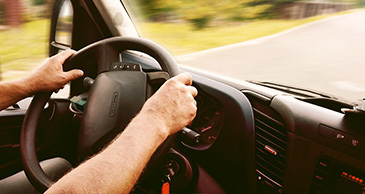 The package includes four 1.5-hour lessons for a total of 6 hours of driving lessons. This is a savings of $115 over the single lesson package price. If you feel that you need more lessons we will add as many as you like at the reduced rate. 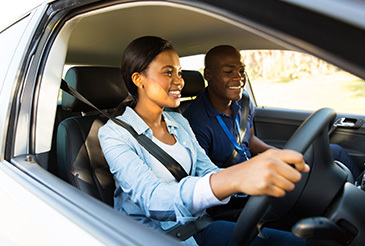 This is an interactive adult-oriented driver education course which includes eight engaging small-group classroom hours, six hours of one-on-one in-car instruction, and a DMV approved driving exam. This class covers everything you need to become a safe driver from basic vehicle control to space management for complex situations. 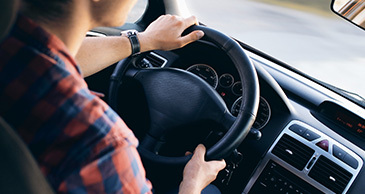 This lesson is 1.5 hours and covers basic maneuvers including starting, stopping, backing, vehicle control, speed control, parking, pulling to and from the curb, right-of-way, push/pull steering and when to use hand-over-hand steering. Even if you’ve never actually driven a car, there’s a good chance you’ve sat in the passenger seat and so you’re familiar with the process. However, it’s still important to go over these essential first steps when you finally get behind the wheel for the first time. Our adult driver’s education program starts out slow and will give you plenty of opportunities to ask questions and become familiar with the road. 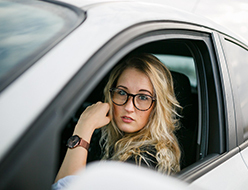 With so much going on both inside and outside of the car, many first-time adult drivers are nervous and might even feel stressed — this is completely normal, so don’t feel self conscious about it. Just take a minute to breathe, get to know the feeling of sitting in the driver’s seat, put your foot on the pedals, your hands on the wheel, and know that it’s OK to take a minute or two before you turn the ignition. An important step of driving, especially when you’re driving an unfamiliar car, is to make any necessary adjustments. When you put your foot on the pedals and hands on the wheel, make sure the seat is at the right distance. You don’t want the seat too far up so there isn’t enough space to move, or too far back so you’re struggling to reach the pedal. Take a look in the rearview mirror, and both side mirrors to make sure you can see behind you. Be sure to also look for basic controls like the windshield wiper, climate controls, and lights. 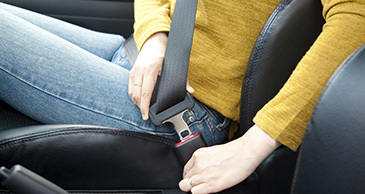 Don’t forget to put your seatbelt on! After you have everything adjusted so you are comfortable, it’s time to turn the car on and go! But don’t forget to go slowly. You may even want to push the gas pedal slightly with the car in park so you know what it feels like. Just a small amount of pressure will be enough to get the car moving. It’s best to start in an area where there aren’t any other vehicles or pedestrians, so you can simply focus on learning how to steer the car and get to know how it all feels. Speed and improper following distance are the biggest reasons for accidents occuring. Whether you are driving on a country road, on downtown streets, or on a highway, it’s essential that you are aware of the speed limit and to be conscious of how much space is in between your car and the one in front of you. It’s recommended that you keep at least two seconds away from the car in front of you. To determine following distance, note when the car in front of you passes a sign or pole. The time it takes for you to reach that same marker should be at least two seconds. Any adult driving instructor will advise new drivers to always be aware of their surroundings. Again, whether you are on a highway or in a city, watch out for other vehicles, motorcycles, pedestrians, bicyclists, street signs, and changes in traffic patterns. Being aware of your surroundings will give you more time to adjust should anything change. Contact us today to learn more about our driving courses or schedule lessons with an instructor. We'll help you get safely started on the road to success! Because distracted driving has become such an issue, our adult driver’s education program will go in-depth into the dangers and consequences, as well as how to avoid, distracted driving. According to the CDC, nine people are killed every day in accidents that occur due to a distracted driver. 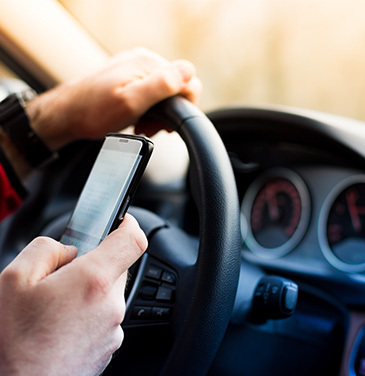 When most people hear the phrase “distracted driving,” they think about a driver who is texting while driving; however, drivers can be distracted by a variety of things. Visual: When something causes you to take your eyes off of the road, anything from a text on your phone or a passenger in the back seat asking you a question. Manual: When something causes you to take your hands off of the wheel, from answering your phone, eating, or reaching for an item that fell. Cognitive: When something causes you to stop thinking about what you are doing, things like daydreaming, talking on the phone, and talking with passengers. Turn Off Your Phone: When your phone is within eyesight and a text or phone call comes in, even a quick glance to see what it says or who it is could be enough to cause an accident. When driving a car, it’s best to simply turn the phone off. Ask For Help: If you have passengers in the car, ask them to take control of the radio, navigating, or anything else that would require you to take your hands, eyes, or mind off of the road. Avoid Eating: We understand that completely avoiding eating in the car can be difficult, especially if it’s a small snack. But when you’re on the road and need a larger meal, especially if it could be messy, it’s best to stop the car and wait to continue until you are completely finished. Get Ready Before Driving: Whether it’s doing your makeup, brushing your hair, or getting directions ready, do this before you start driving. After you complete your adult driver’s education with our instructors, it’s time to set up an appointment with the Oregon DMV. Working with Pacific Driver Education will ensure that you know everything you need to pass both the written test and and road test. Personal ID: A form of documentation that proves legal presence, name, identity, and date of birth. 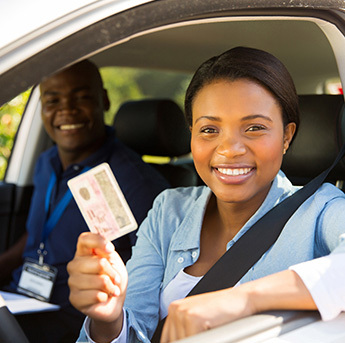 Your driver’s permit, birth certificate, or passport are valid forms of ID. 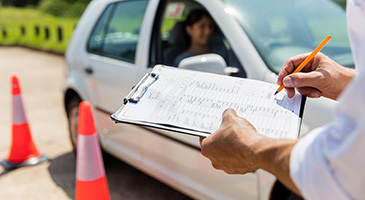 Fees: It is $55 to take a DMV road test, which is required each time you take the test. During the DMV drive test, the examiner will be looking to see if you know and are able to obey road signs and traffic signals. They will also be looking to see if you can properly back up in the car, using the mirrors correctly. They will not ask you questions or offer any advice, but will only give you instruction on where to go. You may notice that they are taking notes in order to keep track of your score. If you score 76 points or more, congratulations! If you score below 76 points, unfortunately you did not pass and need to continue practicing. If you do not pass the road test, you will receive notes relating to the areas that you need to improve on. This could be anything from using turn signals, improperly following right of way rules, driving too fast, failing to come to a complete stop at a crosswalk, or others. It’s important to realize that a lot of people do not pass their DMV driving test the first time around. This simply means that you need to keep practicing. And that’s why Pacific Driver Education is here to help. Our adult driver’s education program is full of helpful information and we will give you plenty of time to practice all of the necessary skills needed to be a licensed driver as well as classroom time to go over rules of the road and more. Learning how to drive as an adult can be challenging, but with the right guidance and help from certified instructors, we are confident that you will be a successful driver! If you have any questions about signing up for adult driving lessons, get in touch with us today!